The Benefits of Butler’s Widespan Structural System | JG Bowers, Inc. The structural system that you select for your building should enhance its features, not place arbitrary limits on them. 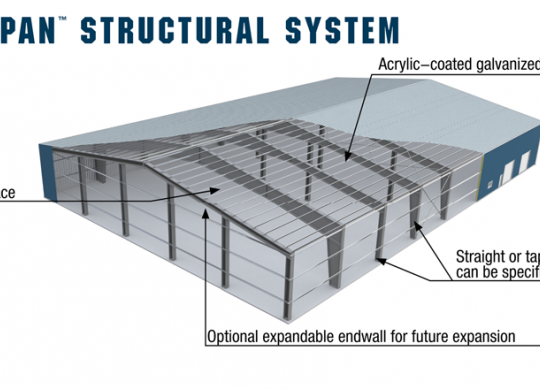 Bearing this in mind, Butler’s Widespan structural system has been engineered to utilize the maximum amount of interior space while also affording you an unmatched level of flexibility in customizing your building’s exterior design. From height and roof slope to width and exterior finish, the Widespan system lets you take full advantage of your building’s interior without forcing you to compromise on exterior and aesthetic characteristics. In this post, we’re going to look at three key advantages to using the Butler Widespan structural system in your next building design project. With its straightforward design, the Widespan system is easy to assemble and maintain. This allows you to focus on more critical aspects of the design rather than losing time to basic, fundamental aspects. Engineered to accommodate future expansions, the Widespan structural system is designed to grow. Should a facility need to increase their floor space, the Widespan system doesn’t just make it possible, it makes it simple. Since every Butler component is manufactured to assemble together, the entire building – structural system, as well as wall and roof systems – can be built faster than if you had used traditional construction methods. At JGBowers, Inc., we aim to provide our clients with the most cost-effective and flexible construction services available. Whether we’re utilizing Butler’s Widespan structural system to reduce build time or their MR-24 roof system to increase lifespan, we take the steps necessary to ensure that our clients’ buildings are equipped with the features – and functionality – that they need to ensure long-term success. If you’ve been looking for a trustworthy, detail-oriented contractor to manage your building process, contact us today to learn more about how we can help.